1869 Ferguson, Port Hope ONT. 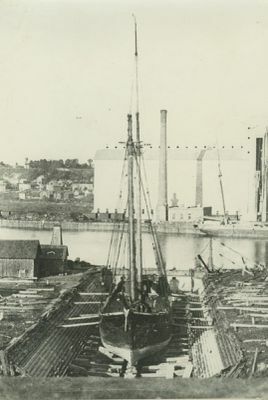 1879 J. Phillips, Port Hope; 162 tons. 1880, Nov 7 Lost much of 150,000 shingles in storm; arrived safely, Oswego, NY. 1890 Went ashore Fall 1889, Georgian Bay; released & towed to Port Huron at Dunford & Alversons dry dock. Purchase reproduction Comment on this item Create electronic postcard Dry docks, Owen Sound.